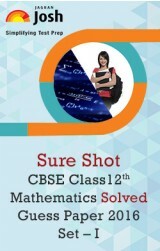 Jagran Josh presents Sure Shot series of solved guess papers for sure success in the board examinations. The Set- I of CBSE Class 12 Mathematics Solved Guess Paper 2016 of this series contains very important questions based on the brief analysis of current examination trend and previous year questions papers. Jagran Josh presents Sure Shot CBSE Class 12 Mathematics Solved Guess Paper for the coming CBSE Board Examination 2016. The pattern of CBSE Class 12 Mathematics has changed significantly since the year 2015. This paper is designed after the brief analysis of current examination trend and previous year questions papers. This paper contains very important questions based on the concepts that are most likely to be asked in the 2016 board exam. This paper also contains the detailed explanation of the questions being framed. This paper will surely build your confidence to get maximum marks in the mathematics paper. Students can also find other study material to boost the level of their 2016 board exam preparation. Previous Article Do you know about the world’s longest lasting light bulb? # Sure Shot Series Mathematics 2016.